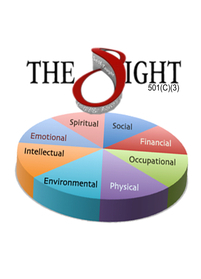 THE EIGHT, Inc. is recognized as Tax-Exempt under section 501(c) (3) of the Internal Revenue Code. THE EIGHT programs are solely supported by the contributions of individuals, companies and organizations that support our mission--is "wellness" --connecting life changing resources to people in need. The Eight operates on a 100% volunteer pool, including the officers. Fundraising efforts, and partnerships help fuel the programs. 99.9% of monies received goes directly to The Eight programs in support of the clients we service. 0.5% is used for marketing cost. 0.5% is used for operating cost including transportation. 100% of In-kind support goes directly to our clients. All donations are tax exempt. We appreciate your continued support of our fundraising drives, volunteerism, in-kind and monetary donations. Thank You. Non-Discrimination Practices: THE EIGHT's main focus is on African-American, Latino, Asian and Native Americans (A.L.A.N.A) communities, however, No person is refused services when in need. THE EIGHT does not and shall not discriminate on the basis of race, color, religion (creed), gender, gender expression, age, national origin (ancestry), disability, marital status, sexual orientation, or military status, in any of its activities or operations. These activities include, but are not limited to, hiring and firing of staff, selection of volunteers and vendors, and provision of services. We are committed to providing an inclusive and welcoming environment for all members of our staff, clients, volunteers, subcontractors, vendors, and clients. THE EIGHT is recognized as Tax-Exempt under section 501(c)(3) of the Internal Revenue Code. THE EIGHT is also classified as a Public Charity under sections 509(a)(1) and 170(b)(A)(vi) of the Internal Revenue Code. THE EIGHT is organized and operates for the support and furtherance of THE EIGHT Programs, and other publicly supported organizations with similar purposes, which subscribe to the mission statement of THE EIGHT Programs. Mailing address: 78365 Hwy 111, Suite 208, La Quinta, CA 92253. O:760/618-1528 F: 888/783-7618. Copyright 2006 All Rights Reserved.